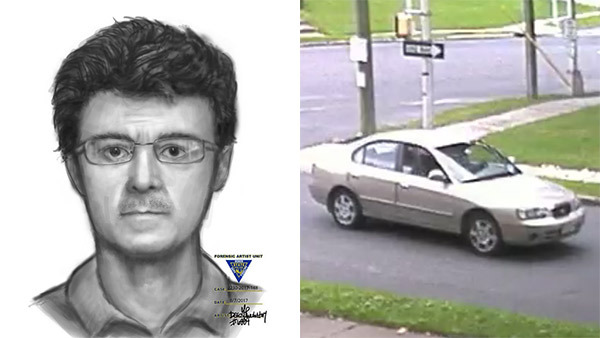 HADDON TWP., N.J. (WPVI) -- The Haddon Township Police Department is searching for a suspect in a luring attempt. It happened on Sunday in the 200 block of Addison Avenue. On Monday night, police released a sketch of the suspect and a surveillance photo of his vehicle. Police say the victim was riding her bicycle on Addison Avenue when a man, driving an older model four-door tan or gold sedan, approached her. Police say he indicated he was sent by her parents to pick her up and take her home. The victim declined and quickly rode away. The suspect is described as a white male, in his late 30s to early 40s, with a light colored skin complexion and dark colored hair. He had no facial hair and was seen wearing thin silver framed, low profile, corrective vision glasses. Additionally, police say the suspect had noticeable wrinkles at the corner of his eyes and above his nose. The suspect was wearing an orange short sleeve collared shirt with no noticeable writing or emblems. The victim further recalled the suspect to have hairy arms and a silver ring on his left hand ring finger. The vehicle is described as possibly a 2003 gold or tan four-door Hyundai Elantra GLS. Anyone with information should call Detective Timothy Hak at (856) 833-6209.